More U.S. families with young children are buying handguns — and that might help explain a recent spike in firearm deaths, a new study suggests. Government figures show that after years of decline, gun-related deaths among U.S. children under age 5 have been on the upswing. Between 2006 and 2016, the rate nearly doubled — from 0.36 deaths for every 100,000 children, to 0.63 per 100,000. 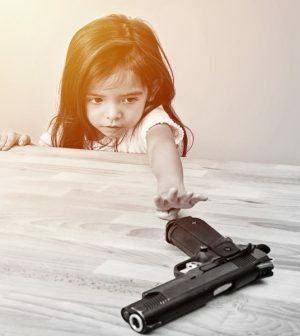 “It’s the changes in firearm type — the shift to handguns in the home — that appears to be putting these young children most at risk,” said lead researcher Kate Prickett. She is the director of the Roy McKenzie Center for the Study of Families and Children at Victoria University in Wellington, New Zealand. For the study, Prickett and her team analyzed years of findings from a nationally representative survey of U.S. households that asked — among other things — about firearms in the home. They compared those patterns against federal statistics on gun-related deaths. Similarly, gun ownership changed over the years. In 1976, half of white families with young children owned a gun. That declined to a low of 29 percent in 2002, before it spiked again — to 45 percent in 2016. The critical change, according to the researchers, was in the type of gun families owned. Back in the 1970s, half of gun-owning families had a rifle — presumably for recreation, like hunting. By 2016, 72 percent of those families had a handgun. It’s reasonable to assume that most of those handguns are meant for protection, according to Dr. Kavita Parikh, who wrote an editorial published with the study. When that’s the goal, she said, families may resist advice to lock guns away, unloaded. Statistics paint a clear picture, said Parikh, a pediatrician at Children’s National Health System in Washington, D.C. The current findings do not prove that the changes in families’ gun ownership have driven up gun deaths among children. But Prickett said they are in line with many studies that all show a “clear and consistent finding.” When it comes to gun-related deaths among children and teenagers, having a gun in the home is one of the strongest risk factors. A seemingly good hiding place is not enough. “What we’re seeing is that kids explore and know where the family firearms are,” Parikh said. She stressed that gun manufacturers have a responsibility, too. Namely, they could invest in developing “smart guns” that can only be operated by the intended person and not by children. But, Prickett said, an overarching federal CAP law — along with other steps, such as universal background checks — might keep more guns out of kids’ hands. Children’s Hospital of Philadelphia has more on children and gun violence.